Purchase this product now and earn 2,995 Reward Points! 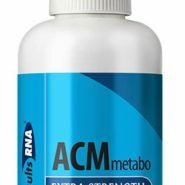 ACM Metabo provides essential nutrients, botanicals and amino acids clinically proven to promote weight loss. Ingredients include Green Tea Extract (ECGC), Glutamine, Green Coffee Bean Extract, Panax Ginseng, Ashwagandha root, Citrus aurantium, Rhodiola rosea, Greater Burdock, Peppermint Leaf and Natural Minerals. ACM Metabo is a proven formula shown to support fat oxidation, induction of weight loss, suppression of unhealthy cravings, and provide anti-inflammatory and antioxidant effects. ACM Metabo delivers the power of each ingredient in the most effective manner possible; achieving maximum results without stomach discomfort or side effects. ACM Metabo is immediately absorbed, simple to take, and has a pleasant taste. Just spray, swish, and swallow.